PE0272. GOING UP (Otto Harbach & Louis A. Hirsch), recorded 1918, w.Arthur Wood Cond. Gaiety Theatre Ensemble; Evelyn Laye, Marjorie Gordon, Joseph Coyne, Austin Melford, Franklyn Bellamy, Henry De Bray, etc. 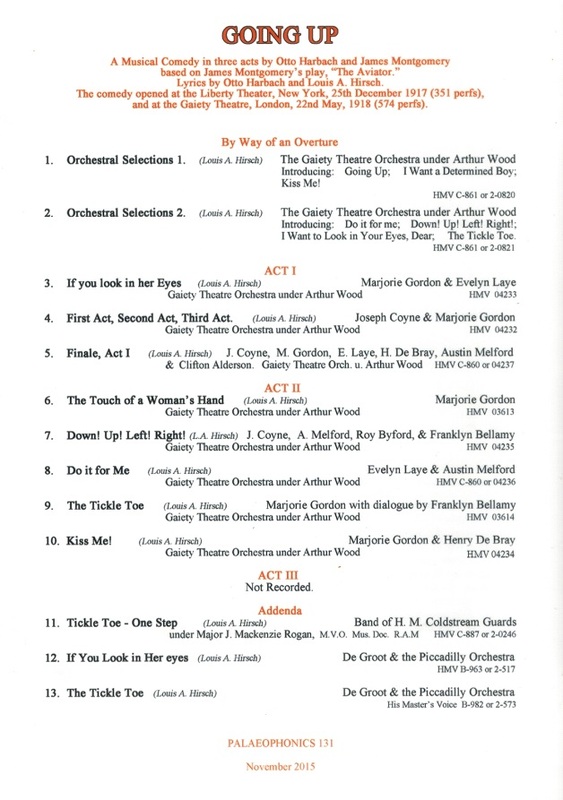 ; Addenda by Band of the Coldstream Guards & De Groot Cond. Piccadilly Orch. (England) Palaeophonics 131, w.Elaborate ‘The Play’ 18pp. Brochure replete with numerous photos of the London Gaiety Theatre 1918 production & biographies. Excellently transferred from the legendary Acoustic 78rpm HMV rarities. “GOING UP is a musical comedy in three acts with music by Louis Hirsch and book and lyrics by Otto Harbach and James Montgomery. Set in Lenox, Massachusetts, (United States) at the end of World War I, the musical tells the story of a writer turned aviator who wins the hand of the high society girl whom he loves by his daring handling of the joystick of a biplane. The musical was a hit on Broadway in 1917 and again the following year in London. Revivals and a film adaptation followed. The development of aviation and flying in the early years of the 20th century captivated the public's attention. 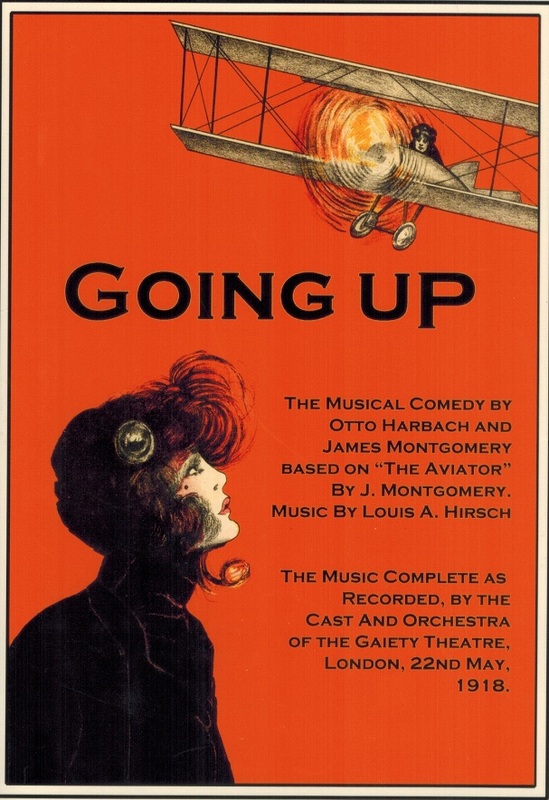 GOING UP is based on a 1910 play, THE AVIATOR, by James Montgomery. The play took on new significance during World War I. The musical was produced by George M. Cohan and Sam H. Harris and, and it opened on Broadway at the Liberty Theatre in New York on 25 December, 1917. It ran for 351 performances, directed by Edward Royce and James Montgomery, starring Edith Day and featuring the young Ed Begley. A full-size biplane was used in the production, delighting audiences. The production ran through October 1918, and three companies were sent out to tour it. In the meantime, the musical was introduced to British audiences in Manchester, England, from 13 May, 1918 before transferring to the Gaiety Theatre to London, opening on 22 May, 1918, and running for an even more successful 574 performances. The London cast starred Joseph Coyne and Marjorie Gordon and featured Evelyn Laye. Reviews were uniformly positive. In Australia, Cyril Ritchard and Madge Elliott starred in the piece in 1919. The piece enjoyed various tours and revivals thereafter. Joseph Coyne, sometimes billed as Joe Coyne, was an American-born singer and actor, known for his appearances in leading roles in Edwardian musical comedy in London. Coyne was born in New York and made his stage début there at Niblo's Garden when he was 16. He appeared for some years in Vaudeville, as part of a double-act, and moved to the legitimate theatre, joining the Rose Lyall Dramatic Company. In 1901, Coyne made his first appearance on the London stage, playing opposite Edna May in THE GIRL FROM UP THERE. After that engagement, he returned to the U.S. until 1906, when he made his second West End appearance. In 1907, he made a great success as Danilo in the original London production of THE MERRY WIDOW, which he followed with a succession of romantic leading roles including Conder in THE DOLLAR PRINCESS (1909), Tony in THE QUAKER GIRL (1910), Teddy in THE DANCING MISTRESS (1912) and Sandy in THE GIRL FROM UTAH (1913). After the First World War, Coyne played Robert Street in GOING UP (1918), Jimmy Smith in NO NO NANETTE (1925) and T. Boggs John in QUEEN HIGH (1926). Among his leading ladies, The Times listed Edna May, Gertie Millar, Lily Elsie, Constance Collier, Gertrude Lawrence and Binnie Hale. Coyne's last appearance was in APRON STRINGS at the Vaudeville Theatre in 1931, in the role of Ezra Hunniwell. He settled in Virginia Water, near Windsor, where he died of pneumonia, aged 73. Marjorie Gordon’s professional stage career began in 1915 on tour in the chorus of the D'Oyly Carte Opera Company. The next season, she was given the roles of the Plaintiff in TRIAL BY JURY and Lady Psyche in PRINCESS IDA. She also understudied and occasionally played the title role in PATIENCE and Yum-Yum in THE MIKADO. She left D'Oyly Carte in June 1916 to understudy the role of Sylvia Dale at the Adelphi Theatre in London in the Rudolf Friml musical HIGH JINKS, sometimes appearing in the role until July 1917 and touring in the role later that year. Gordon starred in the title role in the romantic comic opera VALENTINE at the St. James's Theatre from January to April 1918. She next starred as Grace in the hit musical GOING UP (1918–1919) at London's Gaiety Theatre. She then appeared in the Ivor Novello musical WHO'S HOOPER? at the Adelphi Theatre (1919–1920). Next, she appeared in MY NIECES at the Aldwych Theatre, London, in 1921. For the next two decades, she appeared in both musicals and plays. These included STOP FLIRTING (1923). She later appeared in a few films, playing Ruth Hopkins in DANGER TRAILS (1935), MATRON IN ALL THE WAY TO PARIS (1967) and Passenger in GOLDEN RENDEZVOUS (1977). Later stage roles included Midge in TULIP TIME in 1935 at the Alhambra Theatre. Her last appearance on stage in London was in the ‘revusical promenade’ LET'S ALL GO DOWN THE STRAND at the Adelphi in 1939. She died one month shy of her 90th birthday in Eastbourne, Sussex. For the first few years of her career she mainly played in musical comedy and operetta, including GOING UP in 1918. Among her successes during the 1920s were PHI-PHI (1922), MADAME POMPADOUR (1923), THE DOLLAR PRINCESS, BLUE EYES (1928) and LILAC TIME. She made her Broadway début in 1929 in the American première of Noël Coward's BITTER SWEET and appeared in several early Hollywood film musicals. She continued acting in pantomimes such as THE SLEEPING BEAUTY and CINDERELLA. After the Second World War, she had less success, but she returned to the West End in 1954, in the musical WEDDING IN PARIS. She also acted several times opposite her second husband, actor Frank Lawton, including in the 1956 sitcom MY HUSBAND AND I. Other stage successes included SILVER WEDDING (1957; with Lawton), THE AMOROUS PRAWN (1959) and PHIL THE FLUTER (1969)."